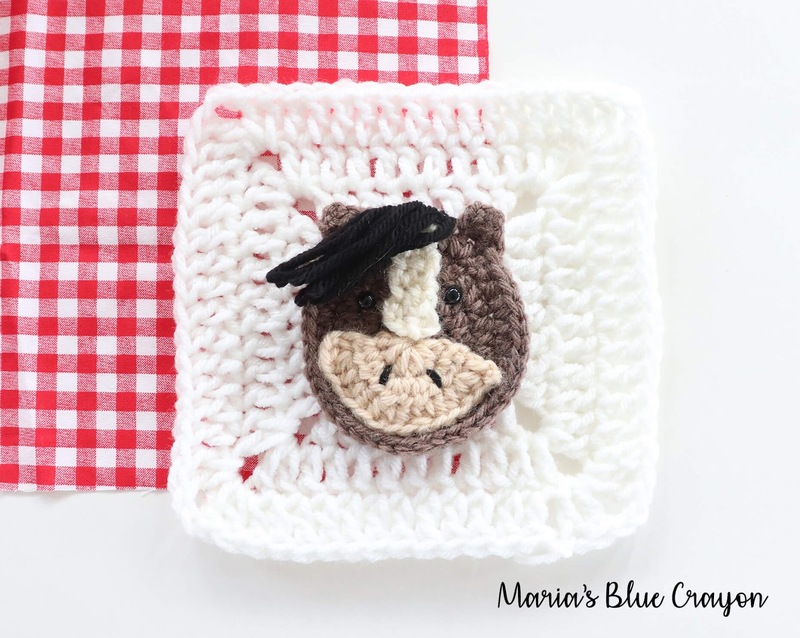 This crochet horse granny square is a part of my Farm Blanket Crochet Along. Do not fasten off, we will begin to make the first ear. Attach brown yarn 4 spaces away from the first ear made. Fasten off and leave long tail for sewing onto granny square. Fasten off and leave tail for sewing onto head. Use tapestry needle and black yarn to sew on nostrils. Use tapestry needle and yarn tail of snout to sew onto head using the photo as a guide. Repeat Row 2 until you have a total of 7 rows. Sew stripe on the horse head with tapestry needle using the photo as a guide. Attach safety eyes using photo as a guide. Add hair to the top of the head between the ears by cutting 6” pieces of yarn, folding them in half, use crochet hook to pull loop half way through stitch, pull yarn ends through loop and pull tight. Trim as necessary. Sew horse onto white granny square.